Hallie Adrian is a career Stylist at Starling Salon in Denver, Colorado. She found footy in 2009 when moving to the Mile High City to start her career. She was drawn to the contact and needed a new sport after playing basketball her whole life and through college. 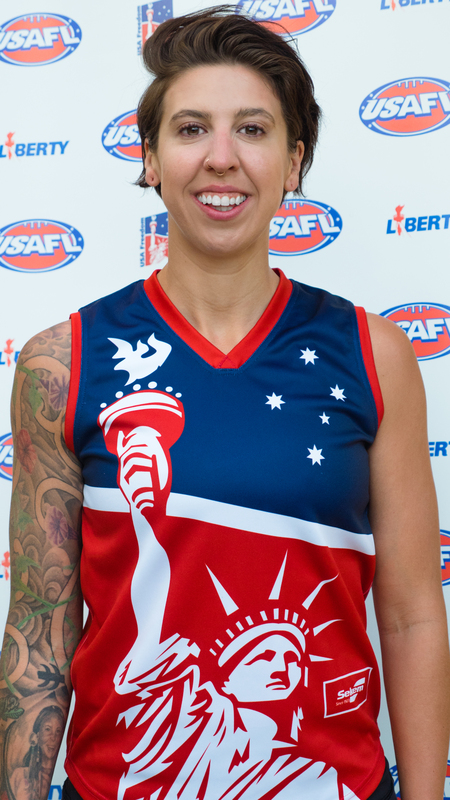 She has climbed the ladder in the USAFL to be named Best and Fairest 2 different years and Grand Final MVP another for the Denver Bulldogs. She has played at Ruck most of her footy career. She is currently the Captain of the Denver Bulldogs and the USA Freedom. She has played for the USA Freedom since 2010. For the USA Freedom, the was named co-MVP in 2014 and was also named to the All-World Team in the IC2014. When Hallie is not playing footy, she is working out, cooking, and spending time with her spouse and fellow teammate, LK.